When It comes To Beer, Some Like It Cold, Some Like It Really Cold For some beer drinkers, just plain cold isn't cold enough – real refreshment begins at a frigid 32 degrees. While it's true that some beers serve well at 32 degrees, many others taste best at the more traditional 38 degree serving temperature. 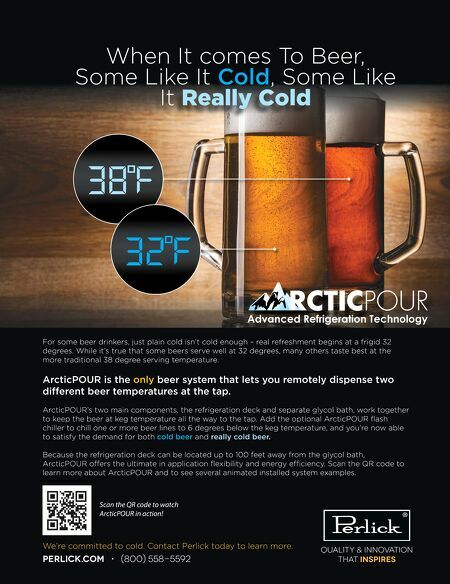 ArcticPOUR is the only beer system that lets you remotely dispense two dif erent beer temperatures at the tap. ArcticPOUR's two main components, the refrigeration deck and separate glycol bath, work together to keep the beer at keg temperature all the way to the tap. Add the optional ArcticPOUR fl ash chiller to chill one or more beer lines to 6 degrees below the keg temperature, and you're now able to satisfy the demand for both cold beer and really cold beer. Because the refrigeration deck can be located up to 100 feet away from the glycol bath, ArcticPOUR of ers the ultimate in application fl exibility and energy ef ciency. Scan the QR code to learn more about ArcticPOUR and to see several animated installed system examples. Quality & Innovation that inspires We're committed to cold. Contact Perlick today to learn more. perlick.com • (800) 558-5592 Scan the QR code to watch ArcticPOUR in action!